Millikan High School Senior Cennemi Diaz captivated the audience with her recitation of Nick Flynn’s “Cartoon Physics Part 1,” winning the top prize at the 10th Annual Los Angeles County Poetry Out Loud contest held recently at the Cerritos Center for the Performing Arts. Diaz set the stage by reciting Tony mHoagland’s poem "Personal" and captured first place, topping 16 other competing students from throughout the county. "I chose poems to give the message of child-like happiness we don’t have to give up," Diaz said. "I was shocked when I turned 18. How did I become an adult so fast? It’s too sudden, too fast. I don’t have to grow up all at once." 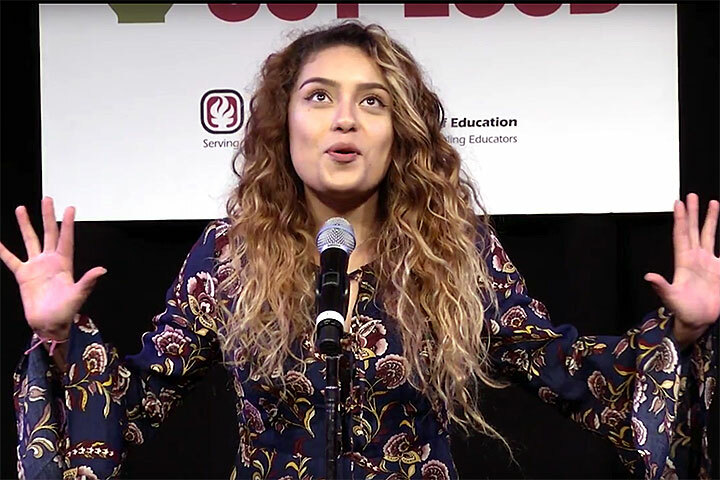 The Los Angeles County Office of Education organized Poetry Out Loud in partnership with the California Arts Council and the National Endowment for the Arts. Poetry Out Loud is a national arts education program that encourages the study of great poetry by offering educational materials and a dynamic recitation competition. Diaz proceeds to the California State Finals on March 12 to 13 in Sacramento. The National Finals will be held April 25 to 26 in Washington, D.C.